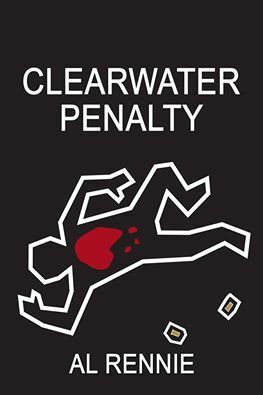 Clearwater Penalty will be available next Friday, May 20th. It is available as a paperback from Createspace and Amazon right now and as an e-book from all the digital providers on the 20th. If you are likely to purchase it, please consider the pre-purchase option as it helps me make a small blip of the various Book Charts. All pre-purchases are credited to May 20th. Penalty preordered.Keep up your frenzied good work Al. Thanks Vern … hope you like this one. Tomorrow is another “circled in red” Al Rennie Day….impatiently waiting for 12:01 am and Amazon to release Clearwater Penalty! Hello again Al, Clearwater Penalty is yet another smash hit! I you pulled all the stops out on this one, surprise visits from Frank and the gang, home grown terrorist cells, Stevie almost dies, and that little twist at the end where you leave us wondering did he commit suicide or did McAdoo have his nephew killed. I loved how you handled little Billy’s grandfather’s passing, so sensitive to Little Billy’s feelings and a little comic relief. You think about those situations and they are so sad and depressing, but not when Doc is in charge and the funeral director kicking them out…..hilarious. By the way, it seems Jimmy and I have something in common, we both love reading books from our favorite author Al Rennie! Outstanding job and I will be watching for the new book so I can get mine pre-ordered ASAP! Have a Day Bubba! p.s. I was looking for the Mia words, but I still haven’t spotted them yet. Wow … that is high praise indeed. Thank you Nancy. I appreciate you support … so much so that my allergies just kicked up. I would like to use your comment in the forward section of my next book. Thanks again. Take care and be safe – have an incredible weekend. Please feel free to use my comment, I’m not just blowing smoke, I recommend you every opportunity that I get…got you two new readers this week. You are great, hope the allergies get better soon……..